Custom Garage Doors are the perfect option for homeowners who prioritize architectural detail and curb appeal at the top of the list. As you can imagine with high-end materials, and an array of optional additions for garage door designs, complete garage door customization comes at a higher market price than Raised Panel and Stamped Carriage Style doors. The process of choosing the right custom garage door can become a challenging task as you begin to consider the many styles and construction components of each custom garage door option. Working closely with trusted garage door professionals is highly recommended during your consideration of custom garage door features. CSS Garage Doors specializes in custom garage door installation in, and around, the Atlanta area. Our experience and knowledge has revealed the best designs, materials, and overall custom garage door manufacturers, both locally and nationwide. With our help, you’ll get the advice needed to complete your custom garage door project with confidence and the peace of mind that comes with knowing that you’re getting the highest quality materials and services at the best price. Custom garage doors feature Faux Finish, Solid Wood, and Overlay designs that fit well with the esthetics of both traditional and modern style homes. As with any garage door design, the most basic decisions to be made for choosing a custom garage door boils down to the appearance and build of the door. Faux Finish doors are a popular choice for homeowners who appreciate the look of hardwood garage doors, but desire the durability and resilience of a metal frame. Solid Wood garage doors are beautifully crafted using high-end woods to meet the needs of homeowners who want the real deal without cutting any corners. Overlay designs open a world of possibilities for customization with additional eye-catching features like elegant arches and crossbeams, multiple layers, and two-toned paint finishes. Faux Finish garage doors are typically the most moderately priced of all custom garage doors, but still come in at a larger price tag than a standard garage door. For those looking to accomplish the look of wood without the price and upkeep of solid wood garage doors, the faux finish garage door gets the job done. 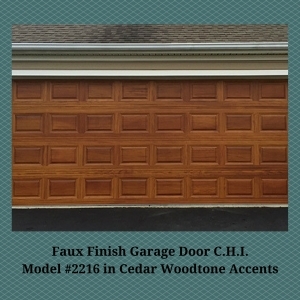 A faux finish door should be indistinguishable from solid wood garage doors when viewed from the curb. Selecting the best manufacturer and recruiting an experienced garage door installation team are both crucial factors that play into the appearance and functionality of your faux finish garage door. A popular choice for completing the look can be found in Doorlink Manufacturing Inc.’s Stamped Carriage Style Garage Door model #3630, where color options include oak and walnut. For more information on additional colors, window options, and the superior strength of the steel-back sandwich build features found in Doorlink Manufacturing Inc.’s Stamped Carriage Style Garage Door model #3630, CLICK HERE. 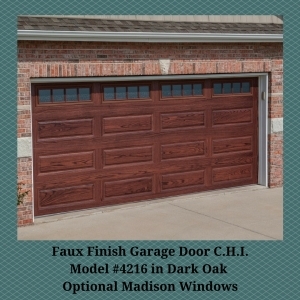 We also recommend considering the faux finish options from C.H.I.’s Accent Collection, where you’ll find great designs in faux cedar, mahogany, driftwood, and light and dark oak finishes that can be added to any standard or custom garage door design. All C.H.I. Woodtone doors are made with premium 2” triple layer steel panels, and are covered with a 6 year warranty on hardware and a 3 year warranty on springs. Once you’ve selected a garage door and the woodtone finish, you can also add window inserts, standard or designer glass, and exterior hardware options to achieve the desired appearance. For more information on C.H.I.’s Faux Finish Woodtones collection, and to review insulation and build options, you can download the Accent Woodtones brochure HERE. Solid wood garage doors are perfect for homeowners who find the idea of faux finished doors underwhelming and desire nothing less than the real deal. Solid wood garage doors should display true craftsmanship as a work of art that becomes the main focal point of your home. Though they will require a little more upkeep and maintenance than the alternative options with faux materials, homeowners who choose the solid wood garage door are usually willing to put in the extra effort to avoid artificial materials. Solid wood garage doors tend to have an unfavorable review by homeowners who have encountered a negative experience with this custom option. As previously mentioned, the factors of how the door is built and how the door looks are the two most important decisions that you can make for your solid wood garage door, or any garage door selection for that matter. 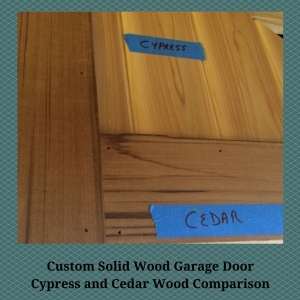 CSS Garage Doors trusts only the best solid wood door manufacturers. We’ve witnessed the difference between the true artisans who take pride in their products, and those who cut corners with cheap tricks to make the sell with low quality materials at the homeowner’s expense. A well designed and properly installed solid wood garage door with regular maintenance and upkeep has the ability to outlast all other custom door options. Our knowledge and experience with reputable companies will aid you in the process of choosing the right manufacturer for your project, which will ultimately add to the longevity of your custom garage door. Solid wood garage doors can be designed to highlight the features of your home with an array of high-end wood options. Though some homeowners opt for woods with colors that accent the particular architectural design of their home like mahogany, walnut, redwood, and oak, the most popular options for the Atlanta area are moisture resistant wood options like cypress and cedar for their ability to withstand the humidity in our natural climate. Other special requests for wood types can usually be produced, as long as the wood type is available, and the homeowner is willing to put in the extra work for necessary maintenance. 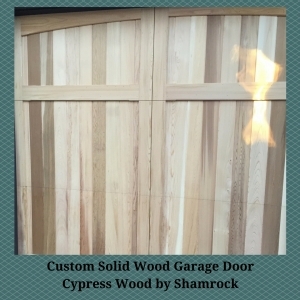 Unlike other premade custom designs, a solid wood garage door can be shaped into a work of art with a unique, one-of-a-kind design that fits the specific aesthetics of the home. This requires the skill of an experienced artisan who can build the door of your dreams with longevity in mind. Most custom wood doors are inspired by the creativity of the homeowner that comes to life with the help of skilled professionals. 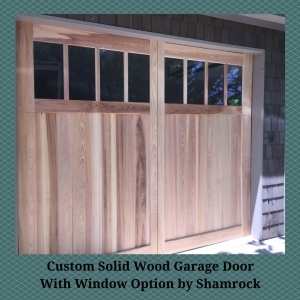 With the flexibility of sizing options to appearance options for wood type, stain finishes, and window designs, it is safe to say that solid wood garage doors are the most customizable of custom garage doors. If the timeless appearance of a solid garage door is what you’re looking for, then the professionals at CSS Garage Doors are here to help. We understand the importance of the garage door selection process, and we are committed to assisting our clients with making the decisions that will best benefit their interests for a beautiful garage door that is built to last. Overlay garage doors are made with detail oriented homeowners in mind. 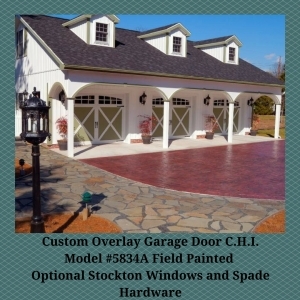 Overlay designs are available for everything from partial to full garage door customization. With an array of color, layers, two-toned finishes, and window options to choose from, the appearance of a well-designed overlay garage door has the ability to bring out the architectural highlights of your home. When choosing the right overlay custom garage door design for your home, it’s always a great idea to consider the manufacturer’s warranty in regards to special features added to your garage door. Our manufacturers stand behind the strength and durability of their overlay designs, which is why they come complete with a manufacturer’s warranty. The most significant factor in choosing the right custom garage door design is often the appearance of the door for our customers. However, the materials used by the manufacturer to construct the door should be as equally as important to ensure superior functionality and longevity. Though custom overlay garage door options vary between designs and build from our manufacturers, we’ll explore the most popular overlay garage doors from two of our trusted manufacturers, and discuss the feature highlights that make them so popular. 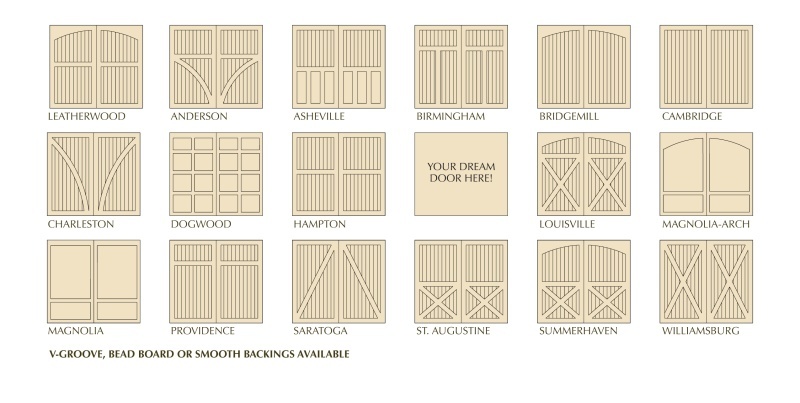 The Carriage House Overlay collection by C.H.I. stands apart from custom garage doors by other manufacturers for their elegant designs and wide selection of customizable options. Each door begins as a blank canvas, and additional features are added to the door to make it specifically unique for your home. 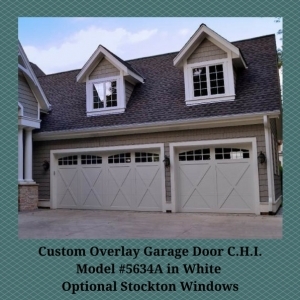 Custom garage doors from C.H.I.’s Carriage House Overlay collection also include the option to upgrade with an Appearance Package. The appearance package offers a completed interior look by covering all exposed hardware in a white finish. Color options for steel and fiberglass overlay garage doors are available in almond, sandstone, and white. Overlay wood options include unfinished cedar or mahogany, which can be stained to your preference. A square top is standard for overlay custom doors, but the option to add an arched top is available. Window inserts with glass options and faux windows are available. 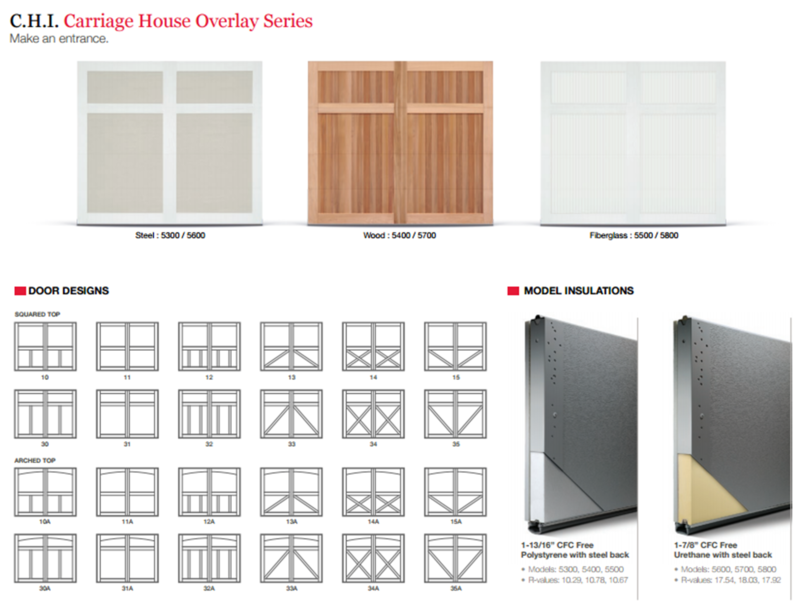 For more information on C.H.I.’s Carriage House Overlay collection, and to review insulation and build options, you can download the Carriage House Overlay brochure HERE. 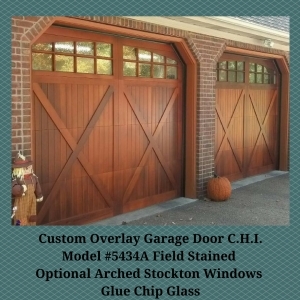 C.H.I.’s carriage style garage doors are offered in steel, fiberglass, or wood. 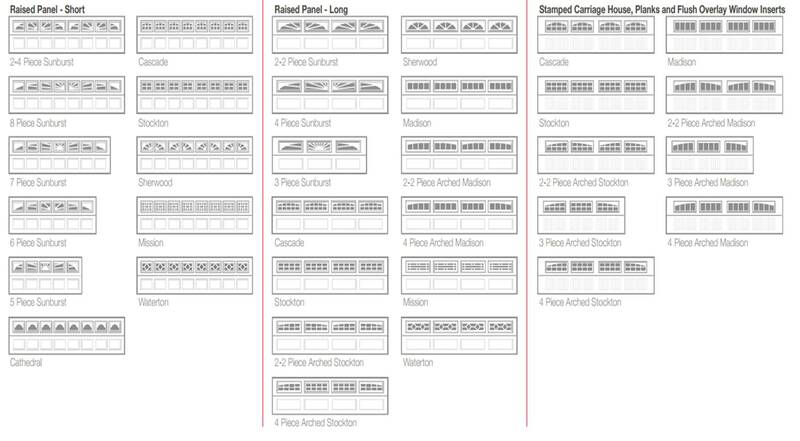 Selections for insulated or non-insulated are available for all custom garage doors. All models are made with 2″ thick CFC-free, polystyrene insulated base carriage garage door sections. Insulated and non-insulated options are available for steel, wood, and fiberglass custom garage doors. Still haven’t found the door of your dreams? 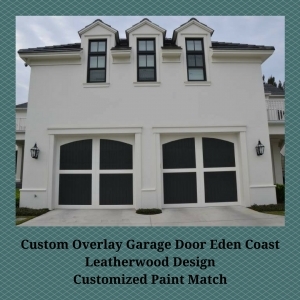 Eden Coast may be the solution to finding that show stopping design for your custom garage door. As a company that helps customers to escape the cookie-cutter options found in traditional garage doors, Eden Coast opens the door to a world of possibilities with an array of unique custom overlay garage door designs. Eden Coast takes pride in making garage door dreams come true. That’s why they stand behind their eco-friendly manufactured designs with an excellent warranty on each door, materials, and hardware. Overlay designs include 17 custom overlay options, with the opportunity to create specialized features for the imaginative homeowner. Includes a variety of eight stain options in wood grain and smooth finishes, as well as custom color options. Additional decorative window insert options are available. Custom molding, routed, or square edges are available with all overlay designs. V-groove, bead board, and smooth backing options are available. Eden Coast doors are made with composite materials that have proven to withstand the test of time. Doors are built with 2” thick steel sandwich design that includes polystyrene foam insulation in options of R value 11.24 and R value 20.04. 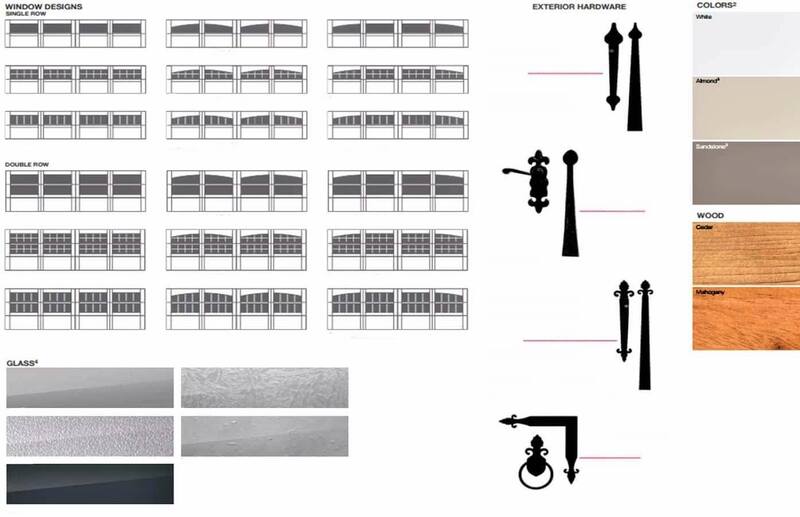 Overlay board thickness ranges from ½” to 1 ½” to achieve desired design. Whether you desire faux finish, solid wood, or custom overlay designs, we encourage you to reach out to CSS Garage Doors with questions and concerns about your upcoming custom garage door project. Our dedicated team of installation experts will guide you through the decision making process with insider tips on the best manufacturers and products for custom garage doors.